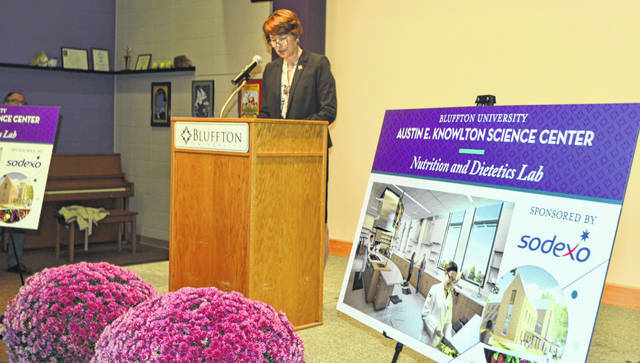 Bluffton University President Jane Wood announces details regarding Sodexo’s $650,000 investment toward the university’s new state of the art Nutrition and Dietetics Lab. BLUFFTON — Bluffton University’s dining services partner Sodexo recently invested $650,000 toward the university’s new Nutrition and Dietetics Lab. The donation is the largest corporate contribution in Bluffton University’s history, according to Bluffton University President Jane Wood. The Nutrition and Dietetics Lab will offer 12 student prep/cooking stations, audio and video streaming capabilities, an instructor demonstration station and additional space for food and equipment storage. The project also includes a multipurpose area and a green roof patio designed for undergraduate instruction and public programs. On Tuesday, Bluffton University students, staff and faculty members gathered at the Marbeck Center on campus to learn more. The lab will be located in the Austin E. Knowlton Science Center, which will be built in the same vicinity as the former Lincoln Hall, a 1920s residence hall. The university hired architects SoL Harris/Day and Bohlin Cywinski Jackson to design the project and contractor Thomas and Marker to construct the new facility. The 32,500-square-foot three-floor facility is designed to support the natural and health science programs and courses such as physics, mathematics, nursing, speech-language pathology, audiology, biology and chemistry. It will feature classrooms, 15 faculty offices and 10 labs. The site development includes a new pedestrian-only central campus. “We are excited to have a great new space for our food demos,” said Bluffton University senior Madeleine Elwell. Bluffton University sophomore Connor Sanders said he is also excited for the new lab to open. As of Thursday, the university has raised over $13.9 million of the $15.5 million needed to fund the Knowlton Science Center. The center is expected to be built by the 2020-2021 school year. The university has raised $23.6 million of the $26 million goal for its Simply Innovate-the Campaign for Bluffton, which supports annual operations, student aid and projects such as the new Knowlton Science Center.